In this scary cute story, the ghouls of Monster High embark upon a quest that brings them from Transylvania to Londoom to New Goreleans and, finally, to Hauntlywood, where monster-movie magic is made. Along the way, they meet new characters and make new friends, whom they join behind the scenes, in front of the cameras and on the Black Carpet. 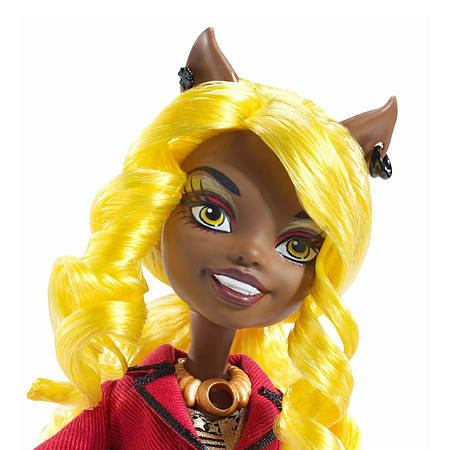 Clawdia Wolf, daughter of the Werewolf and part of Clawdeen?s pack, aims to be a screamwriter, crafting killer screamplays. Her time spent studying in Londoom has been clawesome since she?s been able to sharpen her tribal prep style. Clawdia makes it a point to write every day - it?s the best way to hone her skills. So she always keeps her ever-present tablet and journal, both of which fit in her claws. Designed in her favourite colour, red, the journal has black detailing on the front and the tablet is online. When she?s ready to record her next clawe-inspiring plot, she can take her glasses off her head and put them on to study the tiny scream. Clawdia Wolf, the fierce older sister of Clawdeen Wolf, is sharpening her writing claws while studying screamwriting in Londoom. Wearing her studious black glasses, she carries her ever-present tablet, journal and pen - all three items fit in her hands. Her gold and black tribal chic dress leaves people speechless paired with a red jacket. Red knee socks look clawesome with golden Mary Jane heels. A golden necklace and black earrings are to die for. Doll also comes with signature-style brush, doll stand and diary.